This month is Mother’s day, and all mom’s know that sometimes being a mom is hard. Sometimes a mom just needs a little support. 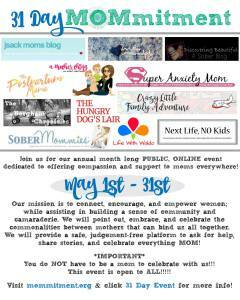 That’s why Mommitment has created a fantastic month long event dedicated to uplifting and supporting all mom’s. Just visit the Mommitment web page for more details and links on how to connect to this online facebook event.